I’m reviewing an Anthem MRX700 home theatre receiver. This has a very elaborate EQ system called ‘Anthem Room Correction’. It comes with a USB microphone and a long cable to reach to a computer. A disc with the software that runs the whole thing. A quite respectable looking adjustable microphone stand. And a long RS-232C cable. Because, unfortunately, RS-232C is how the receiver communicates with a computer. The red line is the measured response. 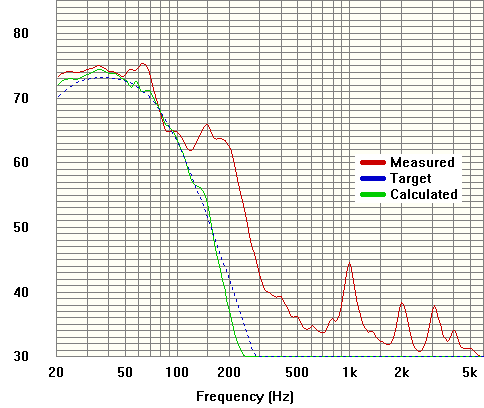 Note how it is only 1dB down at 20 hertz? There are still very few subwoofers that can do that. The power supply is getting a little buzzy, though, after all these years. I wonder if the transformer can be replaced. Very true, the paradigm servo 15 a very good sub, when I tried getting one many years ago, got told they didn’t bring them in the country, because some issue re power supply to do with our local voltage. This was from the original importer in the act. Was very dissapointed and ended up demoing the velodyne dd15 and getting one followed by another more recently.